Ford Focus 1.5 EcoBoost 150 Titanium X 5dr 2019 Review | What Car? What Car? will save you at least £2,022, but our approved dealers could save you even more. 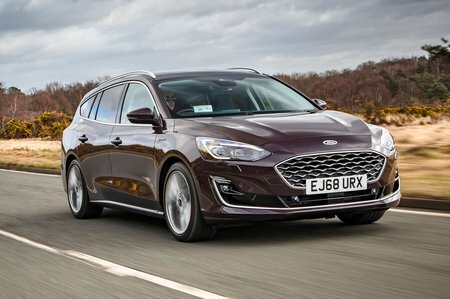 The Ford Focus Estate stands out as the best-handling family wagon, complemented by a decent ride, generous passenger space and a large boot possessed of some handy design features. Just bear in mind that the interior feels distinctly low rent and the seating isn't as versatile as some of its rivals'. Adds 17in alloy wheels, privacy glass, part-leather seat trim and six-way electric driver’s seat adjustment to Titanium, but also makes the Focus Estate rather pricey. The 148bhp 1.5 has noticeably more guts than the 1.0-litre petrols, so makes life easier, especially if you regularly travel with a car full of people and lots of luggage. Indeed, it's strong enough to make the 180bhp version feel redundant and is our pick of the range.